Napa Valley College's Saleem Ali-Musa runs into Merritt's Solomon Bland on his way to the basket Friday night. The American Canyon High boys soccer team was flipping scripts long before it captured its first-ever win over Napa High, 3-2, on Tuesday night at Memorial Stadium. The Wolves won 4-3 last Thursday at Casa Grande, a team it had tied 1-1 earlier, and won 3-1 at home Saturday over Petaluma, which had edged American Canyon 2-1 in their first meeting. Following a seven-game winless streak during which they also lost 4-0 to the visiting Grizzlies, the Wolves beat Napa High for the first time in six tries. Their first season was in fall 2011. Billy Biondini scored twice in the first half for a 2-0 halftime lead and, after Napa High tied it up on goals by Juan Leon and Miguel Hernandez, Jose Lopez scored the winner for American Canyon (8-8-4, 4-5-2 VVAL). Lopez also had the winning goal against Casa Grande for the Wolves, who notched their third consecutive league victory to remain in third place behind the second-place Grizzlies (11-6, 7-3 VVAL). After scoring just once in the first half, the first-place Crushers (17-1-2, 10-0-1 VVAL) broke open Tuesday night’s road game with a second-half, team hat trick. Jorge Galvan had two goals, with assists from Juan Carlos Zepeda and Gerardo Perez, Cole Geschwender scored off another Perez assist, and Anthony Enriquez scored off an assist from goalkeeper Gerardo Fuentes. The Crushers, who have clinched their third straight league title in the wake of back-to-back Monticello Empire League crowns, will close the regular season at Justin-Siena next Tuesday night. The Braves (3-6-3, 2-5-2 VVAL) were up 1-0 at halftime after Jacob Smith scored on a pass from Cristian Gutierrez in the 17th minute en route to the VVAL win at home Saturday night. Sonoma Valley tied the score 10 minutes after halftime. But Gutierrez put the Braves back ahead by converting a penalty kick, earned when the Dragons’ goalkeeper tackled Gutierrez as he appeared on the verge of scoring. The keeper received a red card, getting ejected, and Gutierrez scored again on a corner kick from Kevin Sosa. The Crushers’ last VVAL road game of the season was a defensive battle in front of the Dragons’ enthusiastic Senior Night crowd. Both teams struggled to get anything going and were tied 9-9 at halftime. Alyssa Andrews had 16 points, seven rebounds, three steals and two assists for the Crushers (18-6, 10-1 VVAL), who clinched a share of their second straight league title with second-place Casa Grande having two league losses. Mo Groves, who had eight points and 12 rebounds, “played a fantastic game,” Donohoe said, “matching Sonoma’s physicality defensively.” Kate Ilsley grabbed nine rebounds and had three assists and three steals “while playing her guts out defensively,” the coach added. Nicole Gleeson tallied four points, five rebounds, three steals and four blocks, and “her defensive effort, particularly in the final five minutes, was outstanding,” Donohoe said. Maya Sapienza added four points and six rebounds for the Crushers, who will host Justin-Siena in their own Senior Night game at 7 p.m. Monday. Sam Johannessen had 12 points and Oliver Aandahl capped an 11-point night with the winning basket at the buzzer for the second-place Wolves in Monday night’s Vine Valley Athletic League win at home. Khai Curry contributed seven points for American Canyon (12-12, 7-3 VVAL), which trailed 23-11 at halftime but tied the game with a 13-1 defensive clinic in the third quarter. The Braves led 10-6 at the end of a first quarter that saw Liam McDevitt (12 points) drain the first three of his four 3-pointers. But the Dragons canned a late trey to take a 16-15 halftime lead, and then opened the third quarter on a 7-0 run. After McDevitt cut it to 28-22 with his last trey late in the third, Sonoma Valley put it away with a 14-0 run. Also for Justin-Siena (11-13, 1-9 VVAL), Jadyn Satten and Keith Binz each had five points, Kevin Galvin four, Shane Rosenthal three, and Barrett Donohoe two. Braxton Adderly had 11 of his 19 points and Saleem Ali-Musa scored all of his 17 in the second half for the Storm in Friday night’s Bay Valley Conference home game, but it wasn’t enough to erase the second-place Thunderbirds’ 31-19 halftime lead. The Storm (3-18, 1-7 BVC) hit just four 3-pointers on the night and were 17 of 23 from the free-throw line, while Merritt (13-8, 7-2 BVC) was 24 of 32 from the line and had nine treys. 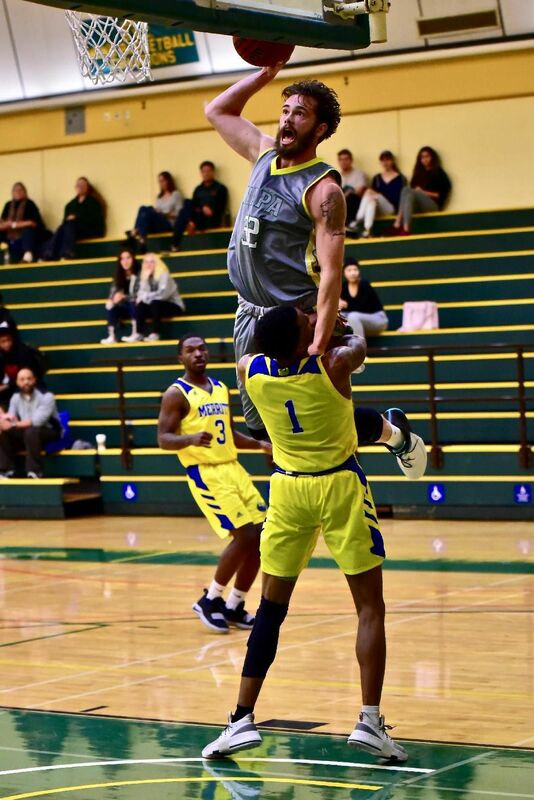 Also scoring for NVC were David Skeete (seven points), Tomas Gomez-Espana and Oscar Frank (five each), Malcolm Bracy (three), Dakota Macias and Terrance Coates (two apiece) and Tyler Gerrard (one). The Thunderbirds’ scorers were Sherab Nyima (19 points), Solomon Bland (17), Carlos Harrison (15) and Jamoni Barber (11), Joe Okitukunda (eight) and Kenny Thompson (two). The Crushers wrapped up their undefeated season with 17-0-2 overall and 9-0-1 VVAL records with Tuesday’s road win. Julian Robledo scored on a Jared Barbosa assist, David Ochoa scored on an Alex Housley assist, and Barbosa followed with a hat trick, getting one assist from Housley and two assists from Kevin Trujillo. Tanner Griffin notched the fifth goal on an Angel Villaseñor assist, and Robledo capped the scoring on an Eric Javar assist.